A new Elliot Scientific Opto-Mechanics Catalogue has been released for 2013. With more than 450 pages, the comprehensive 14Mb PDF is downloadable from links on the Elliot Scientific website or can be read online at Issuu. The catalogue includes details and drawings of all our Mounts, Flexures, Stages, and Slides, plus information on accessories, hardware for optical tables, custom designs and specialist systems. Also released are four updated ‘mini-catalogues’ extracted from the main publication that detail the XYZ Flexure Stages, Miniature Positioners, Fibre Launch Systems and Lab Essentials ranges. These can also be downloaded from their relevant pages by clicking on the links above, or from various pages dotted around our website or read online at Issuu along with our other publications. And if you missed any of our e-newsletters last year, we have compiled them into a handy annual (with built-in web links) that you can also download or read online at Issuu. Alternatively, contact us and we can email you the PDF of choice. The new Laser-Gard Barrier System, from Honeywell Sperian, is the first of its kind in the industry. 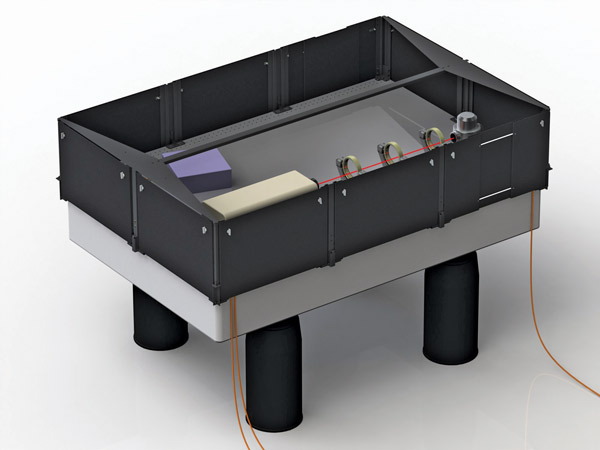 The flexible, modular design offers a unique and customisable way to securely enclose a laser set-up on an optical table. Laser-Gard significantly reduces direct and indirect laser hazard exposure while allowing cable access around the entire perimeter of the optical table. A perimeter attachment system and a unique adjustable panel provides a good fit for variety of table sizes and configurations. Easy to install, remove and transport using basic tools, Laser-Gard saves time and effort if you need to adjust the experiment, and saves space by eliminating the need to use table holes. 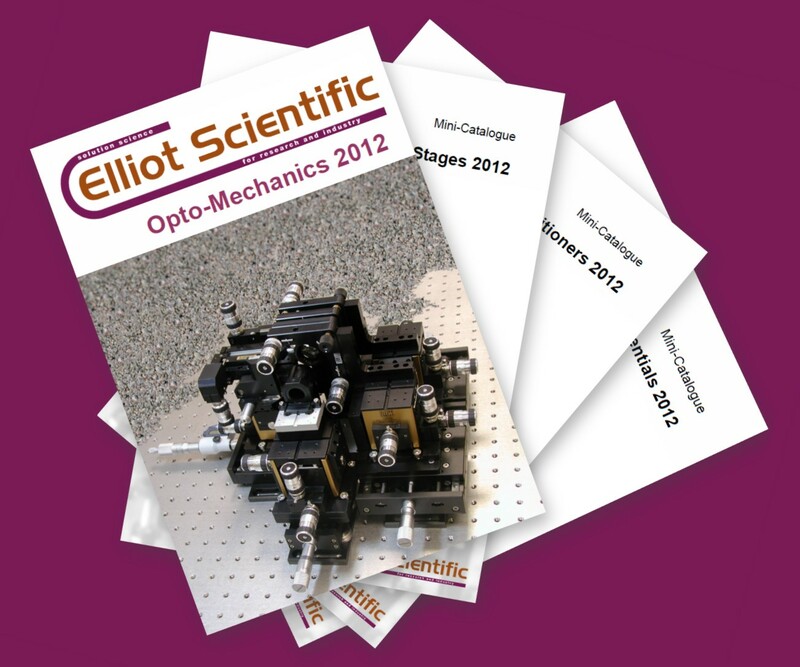 The Elliot Scientific Opto-Mechanics Catalogue has been revised and expanded for 2012. Over 450 pages now make up the comprehensive 15Mb PDF that’s downloadable using the link above, from links on the Elliot Scientific website or can be read online at Issuu. The catalogue includes details and drawings of all our Flexures, Stages and Slides, plus information on accessories, hardware for optical tables, custom designs and specialist systems. Also released are three ‘mini-catalogues’ extracted from the main publication that detail the XYZ Flexure Stage, Miniature Positioner and Lab Essentials ranges. These can also be downloaded from their relevant pages by clicking on the links above, or from various pages dotted around our website or read online at Issuu along with our other publications. Alternatively, contact us and we can email you the catalogue of choice.